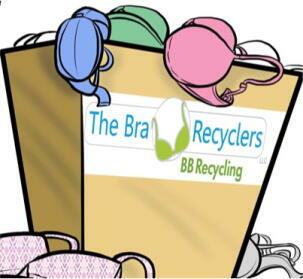 We are BRA-DAZZLING, RECYCLING and offering BRA FIT APPOINTMENTS for October's National Breast Cancer Awareness campaign. Join us for a light fare, mimosas, a private bra fitting from a fit specialist, and a lot of fun! All bras will be 20% off for attendees and you'll receive a gift with purchase. Bring your girlfriends, sister, mother, daughter or grandma for a fun fall morning event. The first 20 to register for bra fit appointments will receive a special gift! Eighty percent of women are wearing the wrong bra size. Women should be fit for a bra at least once a year. The average life span of a sports bra is 6 to 12 months. A woman should be remeasured for a sports bra after major weight loss, weight gain or pregnancy. BRA-DAZZLE your bra for our Breast Cancer Awareness Display Window or bring in gently used bras for recycling and get a chance to win a Brooks sports bra! AMBASSADORS and Drop Off Locations! Bring in your old (preferably lightly used) bras to donate. Your garment will be recycled or redistributed around the world to organizations that assist women and girls in transition.